Learn about binoculars and night vision goggles used for surveillance. This article provides an overview of binoculars and night vision goggles, sometimes abbreviated NVG, that can be used by private investigators for surveillance purposes. Binoculars, also known as field glasses or binocular telescopes, are a pair of identical or mirror-symmetrical telescopes that are mounted side-by-side and aligned to point accurately in the same direction, allowing the viewer to use both eyes (binocular vision) to view distant objects. Most binoculars are sized to be held using both hands. The device is then held up close to the eyes and positioned so both eyes can see clearly without any outside interference or light. Some binocular sizes vary widely, ranging from opera glasses to large pedestal-mounted military equipment. Many different abbreviations are used for the devices, including glasses, binos and bins. 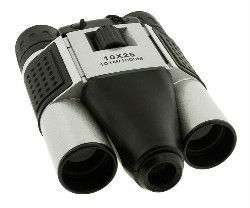 Since binoculars are used both for recreational use and for business, just about anyone might have a need to buy a pair. Sports fans use them to watch sporting events at a distance. Hunters use them to view their prey from afar. Private investigators, security professionals, and law enforcement use binoculars during surveillance missions and stakeout projects to view subjects and their activity from a distance. Detectives use them to get an idea of what is going on with and around the subject, while remaining at a safe distance away. The devices are considered to be a standard tool in a private investigators surveillance tool kit. If you’re looking for a high quality pair of binoculars that you can use for surveillance, I recommend the HD Digital Binocular and DVR. This is a durable and water resistant product that allows you to view objects clearly at a distance and also record what you’re seeing. This can be extremely useful as it will capture everything so you can review it later and even show your client. No need to use separate camera or video equipment. The product has a 10x25mm objective lens with a 101M/1000M view range, which is good for many surveillance missions. The resolution is sharp and clear and also features “steady hold technology” to help improve clarity. Captured video footage is stored to a 32GB MicroSD card. It comes with a USB video output so you can connect to your computer or laptop for easy review. The product is available for $49.99 from Brickhouse Security. Night vision binoculars (also called night vision goggles), scopes and weapon sights provide a person with the ability to see in a dark environment. Night vision is made possible by a combination of two approaches, which involve sufficient spectral range, and sufficient intensity range. Who Needs Night Vision Binoculars? Private investigators and police officers may use night vision binoculars, goggles, scopes and weapons sights while conducting night time surveillance investigations to view the activity of their subject. Many secret relationships and marital infidelity takes place at night, so this equipment is critical to catching subjects while they are active. Using these devices, private investigators and police officers can remain far away at a safe distance and still keep a close eye on their subject. The goal of using such a device is to see clearly in the dark while others have trouble seeing. The physical device consists of an infrared image intensifier tube in a rigid casing, commonly used by military forces. How Are Night Vision Goggles Used? The night vision goggle is a night vision device with dual eyepieces; the device can utilize either one intensifier tube with the same image sent to both eyes, or a separate image intensifier tube for each eye. Other types of binoculars include monocular night vision devices with only one eyepiece which may be mounted to firearms as night sights. Note, these are sometimes referred to as infrared binoculars. Typical accessories that are included with the purchase of a device are: Batteries, which are usually lithium, a neck strap, protective storage and carrying case. Want to get a better view? Try a surveillance drone to get an aerial view of the entire area. Also, you’ll find more digital electronics and other spy gear in our Spy Gear Store. If you have any questions about binoculars and night vision goggles, scopes or optics, please leave a comment below.